A few months ago I found this cute cookbook tucked away in a little corner of Michael's. I have this thing for cookbooks, I mean, I would have bought it either way but the fact that it was just there all alone, I felt the need to rescue it and I'm glad I did because it's really interesting to read and full of great recipes. Ten cities in the United States visited by Burt Wolf and Andy Smith, Boston, New York, Philadelphia, Richmond, Miami, New Orleans, San Antonio, Los Angeles, San Francisco and Chicago. This one came from the Boston chapter. 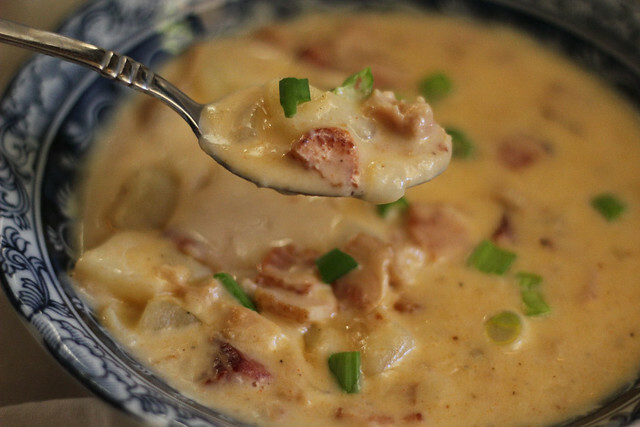 It was VERY good, though the family and I did think that the bacon overpowered the clam taste a bit, so next time I'll be cutting way back on that, but otherwise it was such a delicious soup. Definitely going on the "Make it again" list. 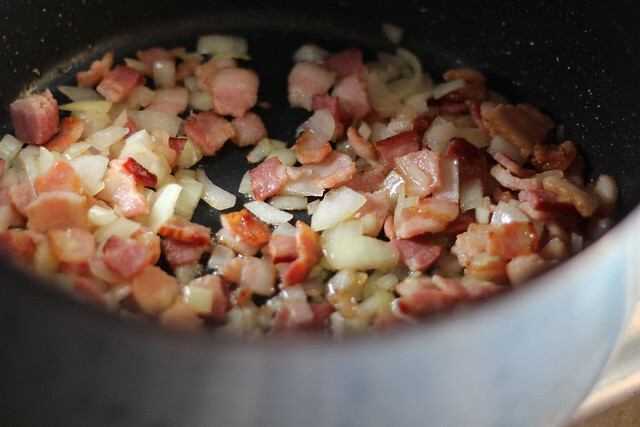 In a medium saucepan over medium heat, heat the bacon, covered, for a minute or until some of the fat has rendered. Uncover the saucepan and continue to saute, stirring constantly for 2 minutes or until a thin film of fat coats the bottom surface of the pan. Add the onions and paprika, cover and cook, over low heat for 5 to 6 minutes, stirring on occasion. Add the water, potatoes, and thyme and bring the liquid to a boil. Reduce the heat and simmer the soup, covered, for about 20 minutes or until the potatoes and tender but not falling apart. Add the clams with their juices and the half and half. 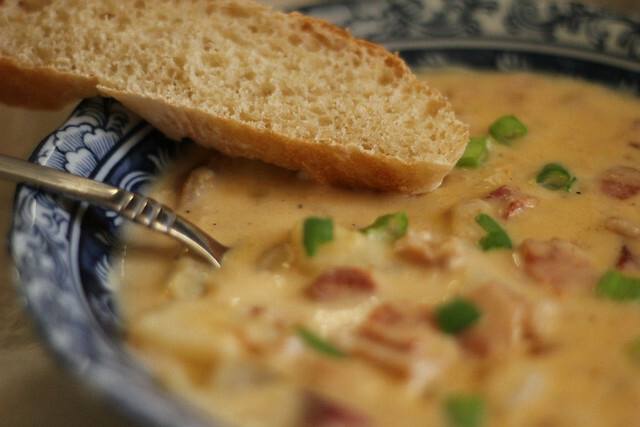 Bring the soup just to a simmer and season with salt and pepper to taste. Serve immediately, each portion garnished with parsley or chives. That sounds so yummy. I am definitely going to try this soon. Is the amount of bacon in your recipe the amount you would use next time, or the original amount that you are going to cut back on?